Ruth Miller lives in downtown Oakland and commutes to UC Berkeley where she is studying for her Masters of City and Regional Planning. Spend a day in Oakland through a city planner’s eyes. If you want to retrace Harvey Milk’s footsteps, go to San Francisco. If you want to use city government to advocate for progressive national policy, go to Berkeley. But if you want to make local change without a lot of time or money, Oakland is listening. Like many cities in this economy, Oakland’s planners, advocates, and businesses have to do more with less, and they’re doing so with inspiring success. Between hip Temescal and busy MacArthur, a new neighborhood is establishing its identify on Telegraph Avenue. The nearby Oakland Islamic Center offered an anchor, but an excess of empty storefronts made space for a handful of Arab shops to open at 30th and Telegraph. 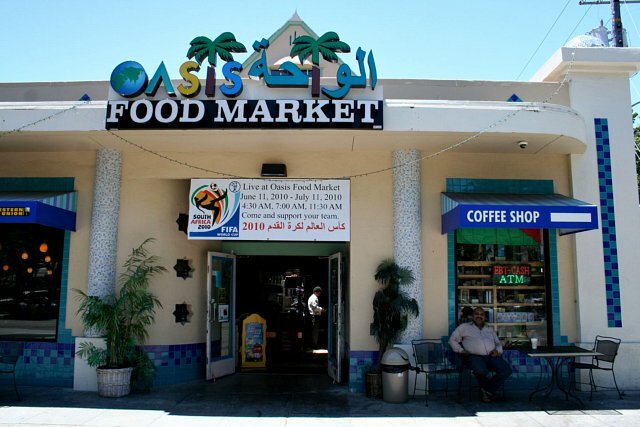 When Oasis came in, it received a $75,000 grant from the city’s Facade and Tenant Improvement Program, which enabled the business to create an attractive storefront. Neighboring residents and longtime local business owners alike have found Oasis to be a boon. Although it opened to skepticism in 2010, is now a cultural and culinary home for people of all backgrounds. Where else in Northern California can you get excellent shawarma, Arabic coffee, and Al Jazeera into the late evening? 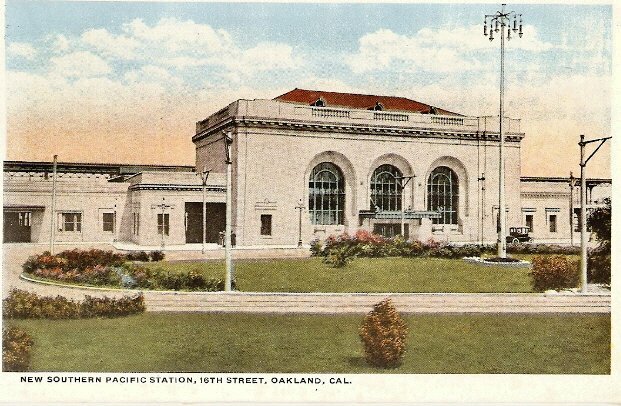 Almost a century ago, Oakland was the western terminal of the Transcontinental Railroad. 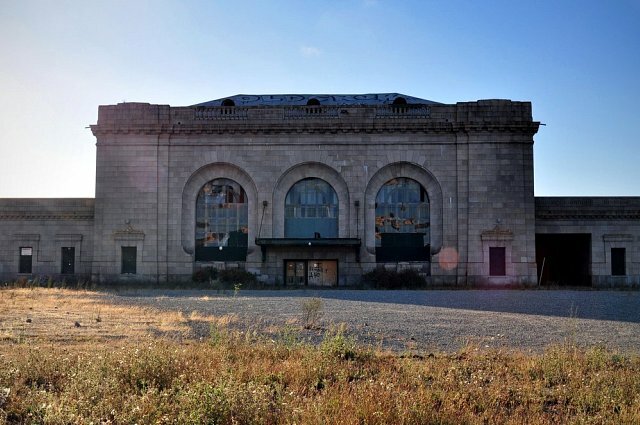 The railroad that changed the nation ended in a beautifully vaulted Beaux Arts-style station on 16th Street in West Oakland. The station was closed after the Loma Prieta earthquake in 1989, and stood watch over a declining neighborhood for years before RAILS (Restoration Association for Improve the Landmark 16th Street Station) formed to revive the space. RAILS is still in fundraising and early planning mode, but they’re working with the community to develop a business model for the station that will be financially sustainable, to serve the neighborhood while honoring the site’s cultural significance. Farmers markets and performance spaces are among the options being considered. RAILS projects it will cost around $36 million to get the building in working order, so expect lots of open houses and events to continue popping up on their Facebook page. Swan’s Market, which opened in 1917, was Oakland’s original downtown marketplace. After closing in 1983, the space sat vacant for 15 years before the City acquired the space and sold it to the East Bay Asian Local Development Corporation for $4. EBALDC transformed the space into a successful and award-winning mixed use and mixed income development. Today, 10th Street and Washington Street is a stunning spectacle of well-preserved Victorian buildings in the area now known as Old Oakland, and it’s beautifully lit by night. Every Friday, the farmers market draws a mix of white-collar office workers and Chinatown residents. Visitors can enjoy several shops, restaurants, and art galleries, including the Museum of Children’s Art and the newly opened farm-to-table Mexican café, Cosecha. The space also welcomes residents, including 18 affordable units and 20 market-rate cohousing condominiums. Pedestrian safety advocates will appreciate making a detour to Oakland’s Chinatown neighborhood. Oakland’s Chinatown is generally older and less affluent than its corollary in San Francisco, but its markets happen to line some of Oakland’s busiest thoroughfares and freeway exits. With 20,000 shoppers every weekend, many of them slower moving than the typical pedestrian, Chinatown’s intersections historically ranked for the highest concentrations of pedestrian/vehicle collisions in Oakland. The parent of a board member of non-profit Asian Health Services was killed in a crosswalk by a car in 2001. 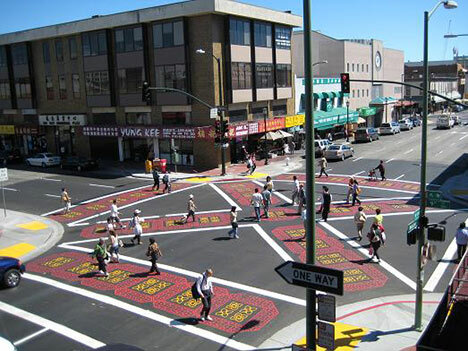 The AHS performed an independent safety study and, with the support of the City of Oakland, installed new diagonal “scramble” crossings. Walking through one of the four scrambles, at the intersections of 8th and 9th at Franklin and Webster Streets, is an experience. The signals are retimed to offer an all-pedestrian phase. During those 15 seconds, the entire section is filled with people – left, right, and diagonal. Though the signal phasing actually increases travel time for all modes, the installation has significantly reduced the number of pedestrian/vehicle collisions. Chinatown’s streets are a model for other intersections with high volumes of both pedestrians and vehicle turns. After a long day, the wandering planner would do well to treat herself to an evening in Uptown Oakland. While slum clearance was a national fad, Oakland’s sputtering economy inadvertently saved its architectural treasures. Today, no part of the City better showcases Oakland’s peculiar mix of architectural gems and nouveau nightlife than the three blocks of Telegraph between 16th and 19th. Of all these treasures, first notice Bar Dogwood, nestled in the 800 square foot ground floor of the National Register Building. Constructed in 1923, this brick and cast iron building has had several lives, but its current owners envisioned a warm, well-worn, and authentic aesthetic. They opened Bar Dogwood in early 2011. When the Oakland Heritage Alliance awarded Bar Dogwood’s owners with the annual Adaptive Use and Rehabilitation Award, they commended the atmosphere as “a cross between Art Deco and rustic lodge, with Deco-inspired backbar mixing with taxidermy and historic photographs of Oakland.” Their Prohibition-era cocktails and local beers aren’t bad, either. Continuing up Telegraph, even a novice architect would be impressed by the recently reopened Fox Theater (built in 1928) and the cobalt blue Flora Restaurant (1931). Smaller buildings house several new restaurants and bars, many of which opened in the last three years. A free shuttle runs Friday and Saturday nights, sponsored in part by the Bay Area air quality district. All in all, it’s great way to wrap up a day in Oakland. The Chinatown scrambles bug the hell out of me, though, because they still prioritize cars over pedestrians. Pedestrians don’t get a walk signal while cars going the same direction have a green light, but cars are allowed to make right turns on red most hours of the day. These priorities should be reversed if you really want a place to be friendly to pedestrians. Cars are (theoretically) supposed to yield to pedestrians when doing a right turn on red. Of course, they’re also theoretically supposed to come to a stop before entering the crosswalk, and that often doesn’t happen, either. Periodically a chapter is circulated that you know will be controversial. It isn’t necessarily a concept that you conceptualized you may be hooked into reading. Nonetheless, the meat of the story has the aspects of something that is too pressing to brush off. Indeed there can be current proclamations that will lead to the web world becoming our nation’s most credible source of meaningful enlightenment.